After rehabbing all offseason on respective knee and hamstring injuries Pau Gasol and Steve Nash gradually progressed their activity level by participating in most of Monday’s practice. Lakers coach Mike D’Antoni said Gasol completed all of Tuesday’s practice, while Nash went through most of it until sitting out of an unspecified drill toward the end of the session. Both Nash and Gasol have reported positive results from their respective rehabs, but the Lakers have taken a conservative approach toward using them in training camp to ensure they stay healthy. Nash’s 32-game absence last season consisted of a fractured left leg that sidelined him for seven weeks in November and December, followed by back and hamstring issues that kept him out for three weeks in April and the last two playoff games. Gasol’s 33 game absence entailed a variety of ailments, including plantar fascia in his right foot, concussion and knee tendinosis. 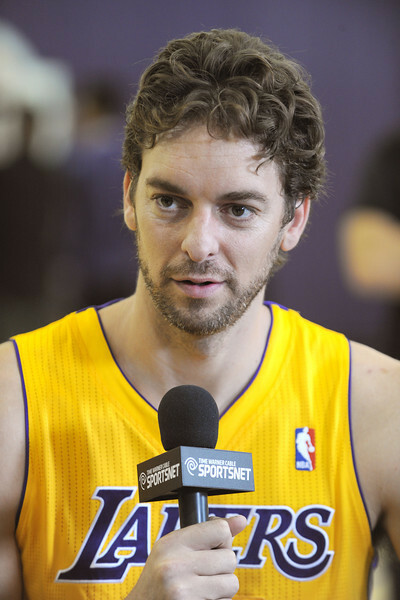 Gasol went through a procedure in May to repair the pain in his knee tendons. But he passed on playing for his native Spain in the FIBA European Championships this summer and hadn’t completed many basketball drills until the Lakers’ began training camp on Saturday. After saying Saturday he planned to sit out some of the eariy sessions, Gasol’s improved health has allowed him to do so otherwise. D’Antoni was obviously joking, but how many more years can he see Gasol playing? This entry was posted in Lakers, Mike D'Antoni, Pau Gasol, Steve Nash by Mark Medina. Bookmark the permalink.